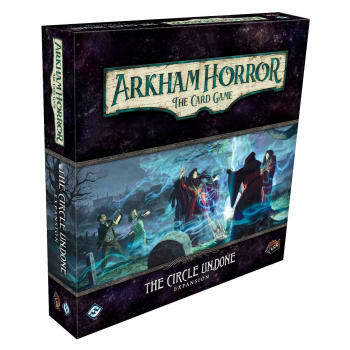 "Behind everything crouched the brooding, festering horror of the ancient town, and of the mouldy, unhallowed garret gable where he wrote and studied..."
-H. P. Lovecraft, "The Dreams in the Witch House"
The Circle Undone is the fourth deluxe expansion for Arkham Horror: The Card Game. Here, your team of investigators delve into the mysteries of Arkham's past, uncovering its macabre history and the motives of those who dwell in its shadows. This expansion contains a playable prologue, first two scenarios of The Circle Undone campaign, as well as new investigator and player cards to further customize your investigations in the world of H. P. Lovecraft's Mythos.